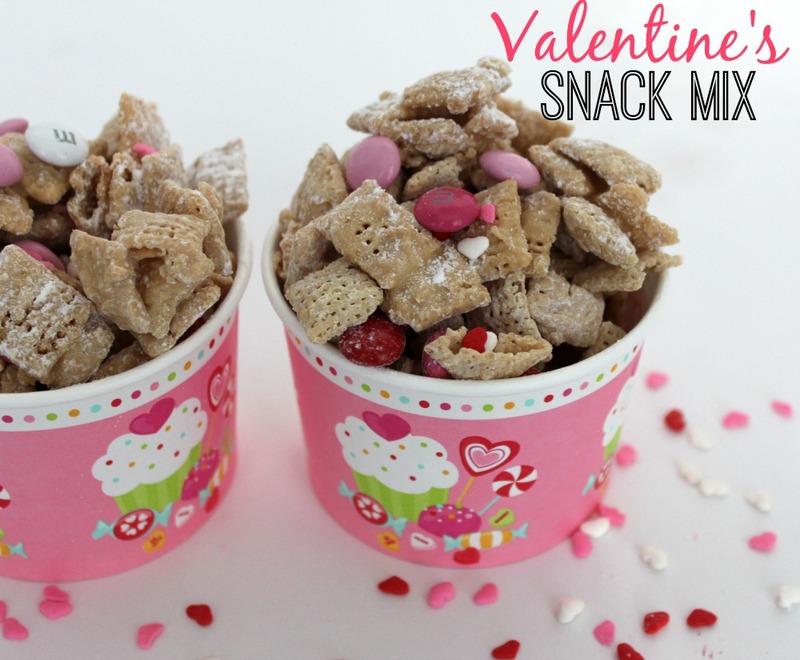 I’ve already had my son request this Valentine Snack Mix or sugar cookies for his class school party. He’s in 5th grade, so you know what that means. This is his last Valentine’s school party. Also, he’s my youngest. So you know what that means. This is MY last Valentine’s class party!! While I deal with this and figure out what emotions I have going on inside of me, let me share with you this recipe. I adapted it from Betty Crocker’s Valentine Chex Mix. I didn’t add as much powdered sugar as theirs called for and instead of white chocolate chips, I used almond bark, because let’s face it – I love the stuff. If it causes some sort of illness, we’re doomed. For this recipe, I obviously used the white almond bark. This stuff is addicting. I made it for our Super Bowl Party and it didn’t last long at all. I even heard someone say “This stuff is addicting.” Yep. 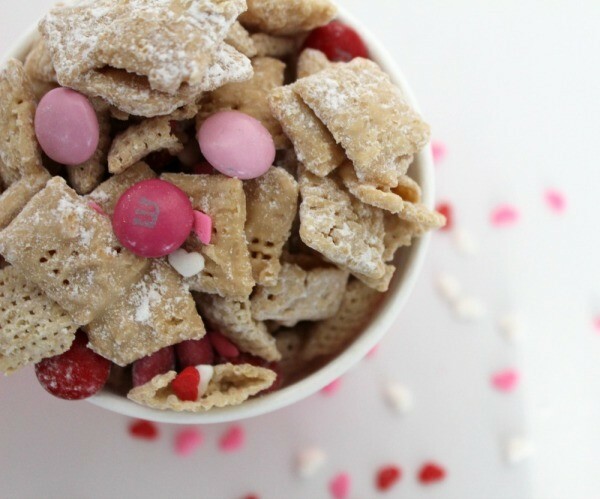 A sweet, crunchy, addicting, melt in your mouth snack for Valentine's Day. 1. Place half of the cereal in a large bowl. Place the other half of the cereal in a large ziploc bag. 2. Microwave the almond bark at 30 second intervals until melted. Stir in the 1/4 cup peanut butter and mix the almond bark and peanut butter together well. 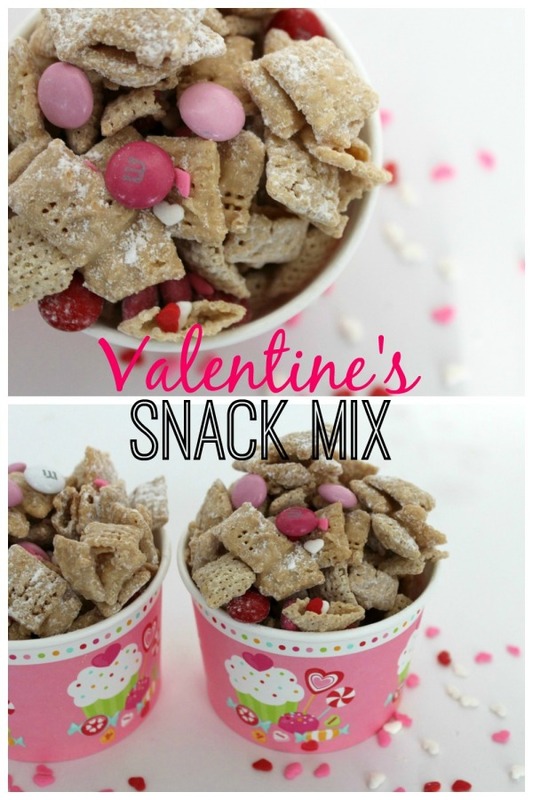 Pour the melted mixture over the rice Chex in the bowl and mix until all coated. Pour in an even layer onto a parchment paper lined cookie sheet. Let set about 15 to 20 minutes. 3. Add the 1/4 cup powdered sugar to the rice Chex in the ziploc bag and shake until coated. 4. When almond bark/peanut butter coated cereal mixture has set, mix both cereal mixtures together in large bowl. Add M&Ms and sprinkles. 5. Serve. Store in air tight container.